The gold stripes around the white bend indicate the illumination of the skeletal structure via radiation, therefore referring to Dr. Monk’s area of medical specialization and expertise. 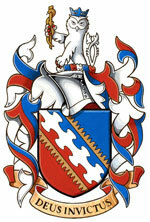 The bend is shown with four loops on each side, a reference to his wife, Alice Maria Chung, and their three daughters. The mythic beast combines part of the ancient symbol of Bohemia, the white double-tailed lion, with an owl’s head. The owl is a traditional symbol of wisdom. Dr. Munk’s father came from Bohemia (the Czech Republic). The rod of Aesculapius represents medicine, and the fleur-de-lis coronet, Dr. Munk's mother’s roots in Quebec. The double border segmented and coloured in red and gold, the most important colours in Chinese symbology, makes a reference to her mother’s Chinese heritage. 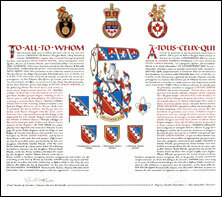 The announcement of the Letters Patent was made on March 17, 2007, in Volume 141, page 586 of the Canada Gazette.